Uh oh, I just found the best rabbit hole. Great interview series w/ #YAlit authors over at @yalsa: http://t.co/X3MLv7qCQJ Goodbye, morning! Today I stumbled upon a treasure trove: the “One Thing Leads to Another” interview series at YALSA. Already the series has talked with some of my favorite Young Adult authors. Reading about their journeys — through life, through writing, through publishing — just fills me up with awe, kinship, and inspiration. The big shift for me was fiction-writing, because it was the first time that I was writing for myself – writing what I wanted to write and not getting paid for it, at least not immediately. That was a very scary thing. And it took an entirely new type of discipline. 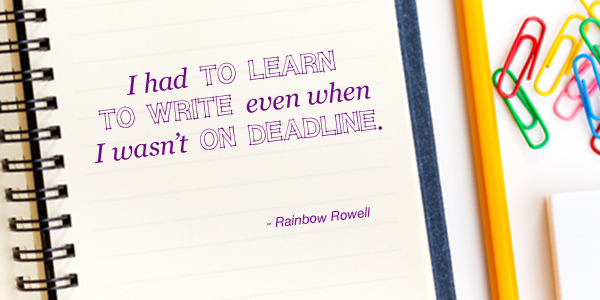 I had to learn to write even when I wasn’t on deadline. Humans tend to make hierarchies out of things. Masculine is better than feminine. See how girls are praised for pursuing traditionally “masculine” things and how boys are shamed for pursuing traditionally “feminine” things. The point of feminism should be that girls can choose how they want to be and not be trapped into a few limiting roles. Feminism loses power if we shame “girliness” or “girlie girls.” If you want to wear pink ribbons or love fashion or want to be a mom more than anything or devour romances (vampire or otherwise), feminism should say, go for it! Just as much as it should encourage the girls who go out for lacrosse or follow car racing or dig technology. Thank you so much for posting this! I love Rainbow’s whole interview, but I think my favorite part is when she talks about the connection between music and her writing. I feel the same way and was nodding along with every word I read!